Simultaneous cardiac and pericardial rupture secondary to blunt chest trauma is a highly lethal combination with a rarely reported survival. ,,,,, This combined injury pattern presents an unique diagnostic and management challenges. We present a young patient with a right atrioventricular groove injury, pericardial rupture and a unique and previously undescribed coronary sinus avulsion. A 17-year-old male presented to our hospital after a high-speed motor vehicle crash that required prolonged extrication followed by rapid-sequence intubation. He required one unit of packed red blood cells for hypotension. On arrival to the trauma bay, he was normotensive with a heart rate of 70 beats/min. A 36-French chest tube was placed for left hemothorax. Initially, a sample of 1500 ml of blood was evacuated before output ceased. Patient remained hemodynamically stable. A focused abdominal sonogram for trauma (FAST) was negative for fluid in the abdominal and cardiac windows. 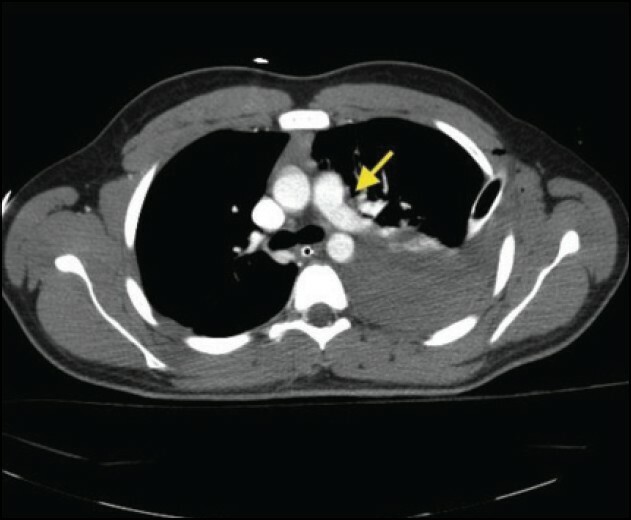 Full-body computed tomography (CT) scan revealed a retained left hemothorax and subtle irregularity of the proximal descending aorta concerning for aortic disruption [Figure 1]. Following imaging, the chest tube resumed high output requiring further resuscitation and emergent exploration. Cardiothoracic surgery was called to the operating room due to concern for aortic disruption. Upon exploring the left chest through a thoracotomy, there was no active hemorrhage in the left pleural space. The aorta was uninjured. The pericardium was traumatically ruptured, but the avulsed and skeletonized left phrenic nerve was intact [Figure 2]. Control of bleeding was attempted by placing a large sheet of surgifoam along the atrioventricular groove at the base of the heart. Shortly thereafter, the heart distended and the patient arrested requiring emergent cardiopulmonary bypass achieved by cannulating the left apex and right atrium. Further, inspection revealed avulsion tears of the coronary sinus extending to the inferior vena cava. There was a separate avulsion of the right atrial appendage near the right coronary artery. Avulsion tears were repaired using pledgeted polypropylene sutures carefully avoiding adjacent coronary arteries. Excellent hemostasis was achieved and cardiopulmonary bypass was weaned. Post-operatively the patient recovered without further cardiac events and has been discharged from rehabilitation. Autopsy studies show that cardiac injury in up to 32% of blunt trauma deaths with 64% of those injuries being cardiac rupture. , Isolated pericardial rupture is less prevalent. Fulda et al. reported only twenty-two pericardial ruptures out of over 20,000 blunt trauma admissions with a mortality rate of 63.6%. In the setting of cardiac rupture, the rate of associated pericardial tear is 10-30%. ,, Cardiac rupture carries a high mortality rate of 50-86% ,, and when combined with pericardial rupture, the mortality is nearly 100%. ,,, There are no previously published reports of coronary sinus avulsion following blunt chest trauma. The clinical signs of these combined injuries are often subtle, but rapid diagnosis is paramount as exsanguinating hemorrhage can quickly ensue. Isolated cardiac rupture often presents with cardiac tamponade, ,, but with simultaneous pericardial rupture, the pericardium is decompressed preventing these classic signs. Ultrasonography and CT scan can be misleading since pericardial fluid may be absent. In our case, FAST revealed no pericardial fluid and chest CT led to a misguided concern for aortic injury. May et al. 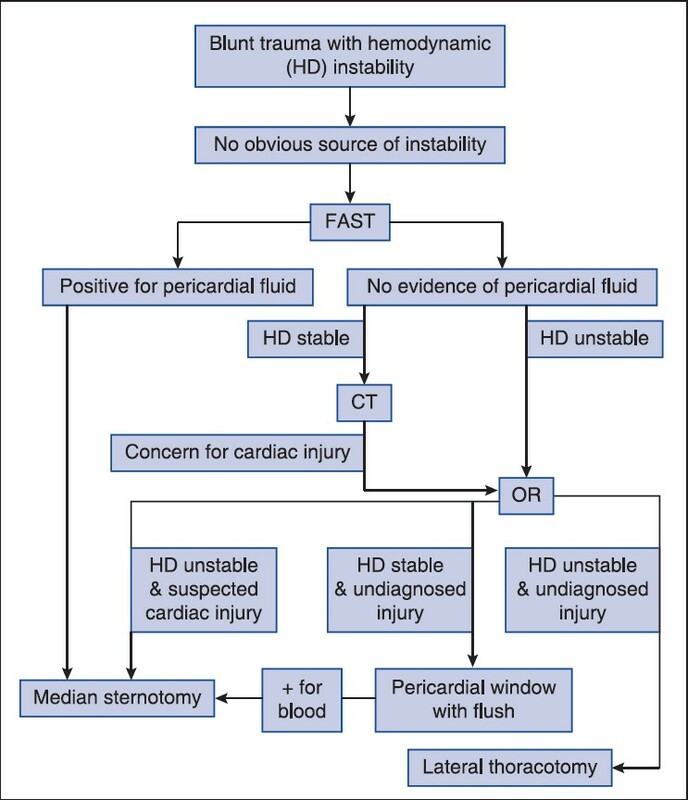 proposed an algorithm to aid in an early diagnosis of combined pericardial and cardiac rupture. CT scan and/or pericardial window with lavage are indicated for patients with no pericardial fluid on FAST with otherwise unexplained hypotension or enlarging mediastinal hematoma. If no blood is initially identified in the pericardial window, pericardial lavage is performed by instilling 100-200 ml of saline into the pericardial sac. If minimal fluid returns, a second rinse is recommended. Failure to return both rinses suggests pericardial injury and necessitates sternotomy. We report a rare survival of combined pericardial and cardiac rupture and a unique coronary sinus avulsion following blunt chest trauma. In addition, we propose an algorithm for its diagnosis and management [Figure 3]. This injury pattern is rare in blunt trauma is usually a highly lethal event. Traditional diagnostics such as FAST and CT are often unhelpful due to the unique combination of injuries. Rapid recognition of this injury is crucial for patient survival. Repair of this spectrum of injuries requires early involvement of cardiac surgery expertise and possibly placement of patient on cardiopulmonary bypass. 1. 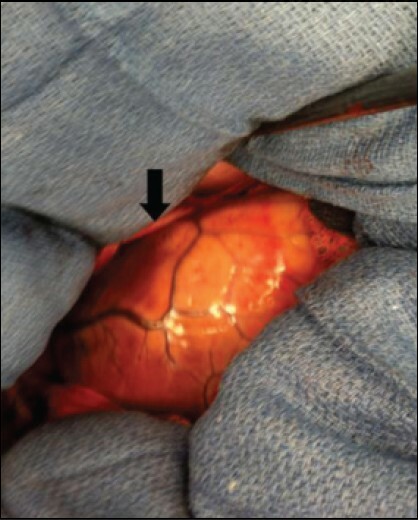 Brathwaite CE, Rodriguez A, Turney SZ, Dunham CM, Cowley R. Blunt traumatic cardiac rupture. A 5-year experience. Ann Surg 1990;212:701-4. 2. Fulda G, Brathwaite CE, Rodriguez A, Turney SZ, Dunham CM, Cowley RA. Blunt traumatic rupture of the heart and pericardium: A ten-year experience (1979-1989). J Trauma 1991;31:167-72. 3. May AK, Patterson MA, Rue LW 3 rd , Schiller HJ, Rotondo MF, Schwab CW. Combined blunt cardiac and pericardial rupture: Review of the literature and report of a new diagnostic algorithm. Am Surg 1999;65:568-74. 4. Pevec WC, Udekwu AO, Peitzman AB. Blunt rupture of the myocardium. Ann Thorac Surg 1989;48:139-42. 5. Teixeira PG, Georgiou C, Inaba K, Dubose J, Plurad D, Chan LS, et al. Blunt cardiac trauma: Lessons learned from the medical examiner. J Trauma 2009;67:1259-64. 6. Türk EE, Tsokos M. Blunt cardiac trauma caused by fatal falls from height: An autopsy-based assessment of the injury pattern. J Trauma 2004;57:301-4. 7. Martin TD, Flynn TC, Rowlands BJ, Ward RE, Fischer RP. Blunt cardiac rupture. J Trauma 1984;24:287-90. 8. Siegel T, Vaughan T, Papadakos PJ. Blunt traumatic rupture of the heart, pericardium, and supradiaphragmatic inferior vena cava: Case report. J Trauma 1994;36:904-5.